Scott Schag takes a minute out of his day in the Education Resource Room. The Ohio State University at Mansfield was supposed to be a stepping stone to his future. Instead, Scott Schag found himself “falling in love” with campus and, in turn, found it to be a launching ground for a remarkable college career. Scott enjoyed his classes, and has no shortage of them to prove it. “I think I liked the campus so much that I hopped around majors in order to stay longer,” he jokes, “I changed four times from Zoology to Theatre to History to Education.” It would prove to be a combination of two of those stops that would prove to be his final destination. Scott first got involved in theater when he was asked to help backstage during Ohio State Mansfield’s collaboration with Mansfield Youth Theater’s production of Beauty and the Beast, Jr. Scott enjoyed working with young actors and that experience caused him to enroll in a class in which he was immersed in a local classroom. He was not disappointed. Working on stage and in the classroom were so enjoyable that it would finally settle a long time question of “What should my major be?” for good. In his 7 years on campus, Scott has been involved in a variety of things on campus and in the community. His stay has seen him as a Writing Consultant in the Campus Writing Center, a Welcome Leader for student orientations, a member of the English Club, Theatre Club, Club Ed, volunteering at local non-profits, and on stage. Scott’s most recent show, 9 to 5 The Musical, marks his 30th production. He has gone from backstage to filling roles such as the Cat in the Hat in Seussical the Musical, playing Seymour in Little Shop of Horrors, The UPS man in Legally Blonde, and Victor Frankenstein in Playing with Fire: After Frankenstein. 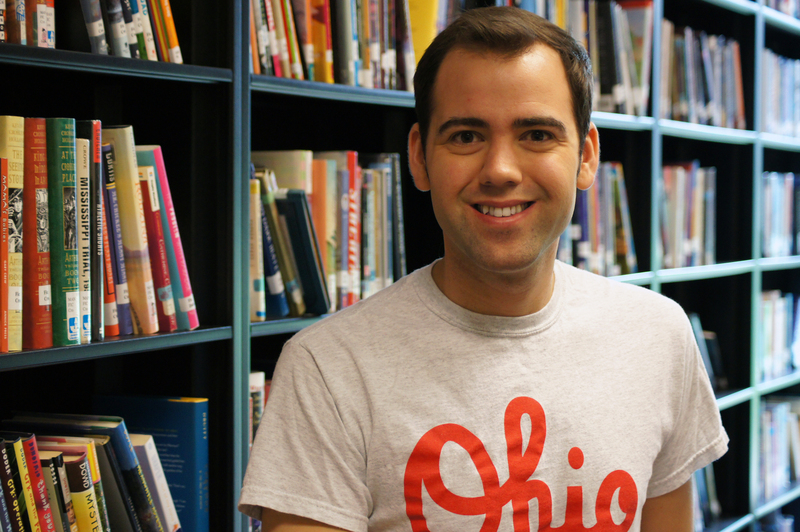 As he enters the world stage, Scott is preparing to become an educator just like the ones he met at Ohio State Mansfield. “I never felt that a professor didn’t want to be there. They want you to succeed!” And as a result, those professors have watched Scott do just that. Posted by Christina Drain at 3:07pm December 30, 2013 Posted in Students/Campus Life and tagged But For Ohio State, Ohio, Ohio State Mansfield. Bookmark the permalink.